The book has been awarded with the Literature Award 2013 of the Information Technology Society for “outstanding publications”. 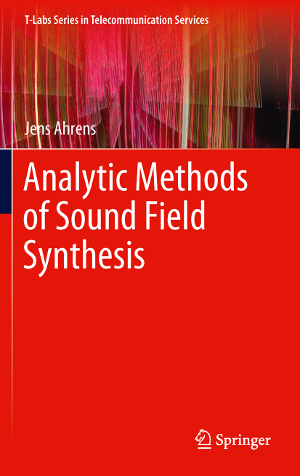 Sound field synthesis may be defined as the problem of driving a given ensemble of elementary sound sources such that the superposition of the sound fields emitted by the individual elementary sound sources produces a sound field with given desired physical properties over an extended area. An introduction to the topic can be found in this article, which was published in the popular science magazine Acoustics Today. The following animation illustrates the concept: The sound field radiated by a real source (left image) is synthesized inside a densely spaced loudspeaker array – in the present case a quadratic one (right image). The book treats the topic in the context of spatial audio though the contents are also relevant in other areas such as underwater acoustics or ultrasonics. A fundamental formulation based on standard integral equations is derived and the single-layer potential approach is identified as a useful tool in order to derive a general solution. It is shown that the two established analytic approaches of Wave Field Synthesis and Near-field Compensated Higher Order Ambisonics (i.e. Ambisonics with distance coding) constitute specific solutions to the general problem, which are covered by the single-layer potential solution and its extensions. A juxtaposition of those methods is thus straightforward and is presented in detail. The consequences of spatial discretization (a.k.a. spatial aliasing) are analyzed extensively for all elementary geometries of secondary source distributions and applications such as the synthesis of the sound field of moving virtual sound sources, focused virtual sound sources, and virtual sound sources with complex radiation properties are discussed. Implementation details are also discussed. You can find Matlab scripts for all simulations contained in the book here. The Springer site provides samples of the Table of Contents as well as Chapter 2. Most of Chapter 1 and some more excerpts are available, for example, on Amazon.